This is a wonderful and unique day tour on the worlds second highest volcano with great views and the adrenaline flow. The adventure begin in thin air just below the glacier of the active and impressive snow covered Cotopaxi volcano. 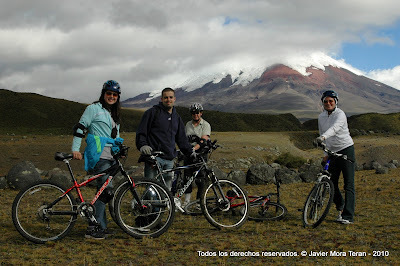 First part is downhill biking in a landscape dominated by volcanic ash and páramo vegetation. Afterwards some pedaling on the plateau between big volcanic rocks and wild horses and the more downhill on dirt roads through a pine forest and at the end a single track.